Amid growing income inequality and the erosion of job security as a result of disruptions, countries have to grapple increasingly with how to help citizens who are left behind, in an effective and financially prudent way. For instance, Finland, a welfare state, started a two-year trial in January last year to provide 2,000 randomly chosen unemployed citizens with a basic monthly income of €560 (S$900) in an experiment to remove the disincentive to work. For these recipients can still receive the payment even if they find work, unlike the usual case with unemployment benefits. While Finland has not announced the results of the €20 million programme, it was reported last week that it will not extend it. In Singapore, the issue of how to help the needy was also a focus during this year's Budget debate. 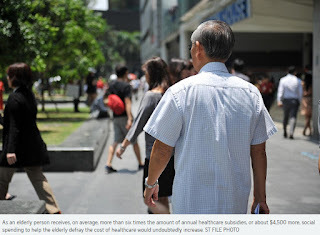 Finance Minister Heng Swee Keat announced an impending rise in social spending on healthcare and the need for an increase in goods and services tax (GST) to help finance the increased expenditure. The Straits Times takes a closer look at social spending. Q WHAT IS SOCIAL SPENDING? A A country's social expenditure is made up of cash handouts, rebates, subsidies and social welfare in areas such as home ownership, healthcare and education to improve the standard of living of its citizens. More benefits may be targeted at specific groups such as low-income households or the unemployed, to reduce social inequality. Q DOES SOCIAL EXPENDITURE IN SINGAPORE BENEFIT ME? A As social spending encompasses healthcare, housing and education, all Singaporeans are beneficiaries, as well as permanent residents, albeit to a smaller extent. For instance, in 2016, the Government spent almost $14,000 per year to subsidise the school fees and expenses of each secondary school and Institute of Technical Education student, according to data from the Department of Statistics. This is around $16,000 a year for a junior college or polytechnic student, and nearly $22,000 a year for a university student. The Government also heavily subsidises healthcare and public housing costs. Q HOW MUCH IS SINGAPORE'S SOCIAL EXPENDITURE? A Last year, the Government used $36.9 billion, or half of its total expenditure, on social spending, which went to areas including healthcare, education, social and family development programmes. Social spending has risen by three times since 2006, when it was $12.7 billion. In the coming decade, social spending is set to increase even further. Q HOW DOES SINGAPORE'S PROPORTION OF SOCIAL SPENDING COMPARE WITH THAT OF OTHER COUNTRIES? A Singapore's 2017 social expenditure of $36.9 billion is 8.2 per cent of its gross domestic product (GDP) of $447 billion. According to the Organisation for Economic Cooperation and Development (OECD), Britain's social expenditure was around 20 per cent of its GDP in 2016; Finland's was 31 per cent; France's was 32 per cent; and South Korea's was about 10 per cent. Of these, Finland and France are welfare states. Their citizens need not worry about education or healthcare costs as these are completely funded by the government. However, to fund these welfare programmes, taxation is high. The average working Finn who earns €40,000 annually pays about 40 per cent of his salary as tax. In Singapore, a middle-income worker earning around $55,000 per year pays 3 per cent of his salary as income tax. Singapore's proportion of social spending to its GDP is lower as it adopts a targeted, multi-layered approach. For areas such as education and public housing, subsidies apply almost equally to all citizens. There are also programmes, such as rental housing and financial assistance schemes, which are targeted at people who need them more. Q IS HIGHER SOCIAL EXPENDITURE ALWAYS GOOD? A Spending more does not always mean better results. Even though Singapore spent just 2 per cent of its GDP on healthcare last year, it has been consistently ranked among the top in the world in terms of healthcare system performance. The United States spent US$3.5 trillion (S$4.6 trillion) or around 18 per cent of its GDP on healthcare last year, the highest in the world. Yet, its healthcare system ranks relatively poorly among developed countries, according to the World Health Organisation among others. However, countries like Iceland, Denmark, Norway and Finland, which spend a higher proportion of their GDP on social spending, do see a more equal distribution of incomes. All have Gini coefficients ranging from just 0.24 to 0.26 in 2016, with Iceland the most equal society among OECD countries. The Gini coefficient is a number between 0 and 1 used to measure social equality. A lower coefficient indicates a more equal distribution of incomes. Q WHAT WILL DRIVE THE GOVERNMENT'S SOCIAL SPENDING IN FUTURE? A In an interview with The Straits Times published on Jan 28, Deputy Prime Minister Tharman Shanmugaratnam said Singapore's biggest challenges ahead include tackling an ageing population and improving social mobility. Today, one in eight Singaporeans is aged 65 and above. By 2030, the ratio will be one in four. As an elderly person receives, on average, more than six times the amount of annual healthcare subsidies, or about $4,500 more, social spending to help the elderly defray the cost of healthcare would undoubtedly increase. Mr Heng said he predicts that government healthcare spending will go up by at least $3 billion by 2020. In the 2018 Budget, $10.2 billion was allocated to healthcare, compared with $4 billion in 2010. Another concern is the widening income gap in Singapore. While Singapore's Gini coefficient fell to 0.458 in 2016, its lowest in a decade, it remains one of the most unequal among developed societies. In February, Prime Minister Lee Hsien Loong said Singapore's society will fracture and the country will wither if widening income inequalities create a rigid and stratified social system. To improve social mobility, PM Lee said the Government will strengthen its efforts in education, with measures such as improving pre-schools and giving out bursaries. The Government will also continue to be "deliberate and proactive" in encouraging more social mixing among different social classes, he added. Q INCREASE TAXES OR TAP NATIONAL RESERVES: HOW SHOULD SINGAPORE'S INCREASE IN SOCIAL SPENDING BE FUNDED? A While the actual amount of financial reserves Singapore has is not revealed for strategic reasons, it is estimated to be over $1 trillion. When Mr Heng announced in his Budget 2018 statement that GST would be increased from 7 per cent to 9 per cent some time between 2021 and 2025 to fund increased government expenditure, which includes social spending, some called for the Government to draw on its reserves instead. Workers' Party MP Pritam Singh said during the Budget debate that the Government should look into raising money from selling land as an alternative. This is currently not allowed under the Constitution as land forms part of Singapore's past reserves, which are not available for budgetary spending. Survey results released in January by the Institute of Policy Studies found that Singaporeans were split, almost in the middle, over whether higher social spending should be funded by tax increases or tapping reserves. Under the Net Investment Returns Contribution (NIRC) framework, the Government manages and invests the country's reserves, and allows half of the returns on those investments to be withdrawn to fund government expenditure. The other half is deposited into the national reserves for it to be reinvested to grow the reserves. Last year, the NIRC contributed $14.6 billion to the Budget, which makes it the largest contributor to Singapore's revenue. Some, like Mr Singh, have asked the Government to use more than half of the NIRC to fund large increases in government spending when required, so that a GST hike can be avoided. But Mr Heng said that by drawing down on the main reserves pool or taking a larger percentage of the NIRC, the amount of money available for investments is consequently lower and the amount of returns in the future might not keep up with the country's needs. The reserves also allow Singapore to maintain its long-term economic stability during periods such as the 1997 Asian financial crisis, where Singapore's reserves and strong economic fundamentals fended off currency attacks that crippled other regional currencies, said Mr Heng. Q HOW DOES THE GOVERNMENT INTEND TO BALANCE SOCIAL SPENDING WITH FINANCIAL PRUDENCE? A At 19 per cent of GDP, the estimated total government expenditure for financial year 2018 would be smaller in proportion than that of most developed nations, Mr Heng said in his Budget 2018 statement. Singapore has been able to get good returns for money spent, delivering good outcomes in areas like healthcare and education, which are highly ranked globally, he said. But the Government must continue to carefully manage expenditure growth, and "get the best value for every dollar we spend", he said, calling for efficiency over excess. From April 1 next year, the rate at which ministries' "block" budgets can grow would also be cut to 0.3 times GDP growth, down from 0.4 currently, Mr Heng said in his 2018 Budget statement. This is the fifth of 12 primers on current affairs issues that are part of the outreach programme for The Straits Times-Ministry of Education National Current Affairs Quiz.